Specially designed punch used mainly to create the ostomy on the Arteries and veins. Some of the cases, punch used in the Intestine also. Circumferential cut made with the surgical punch of 10 degrees undercut moves the tissue away from the inner lumen of the targeted material. The punch helps in the making the clean and round hole on the tissues. Hollow cutting tip with 10 degrees undercut moves tissue away from inside edge of a hole during the cut to provide a clean and round hole. It is available from the range of 2.7mm to 6 mm punches. It is designed with the double cutting action blades, by this way ostomy can be achieved and waste tissue will come with the punch. The length may vary according to the punch sizes. The punch has a body like a pen with the finger ring that helps the user to hold using the fingers for greater control with an accurate hole can be made. 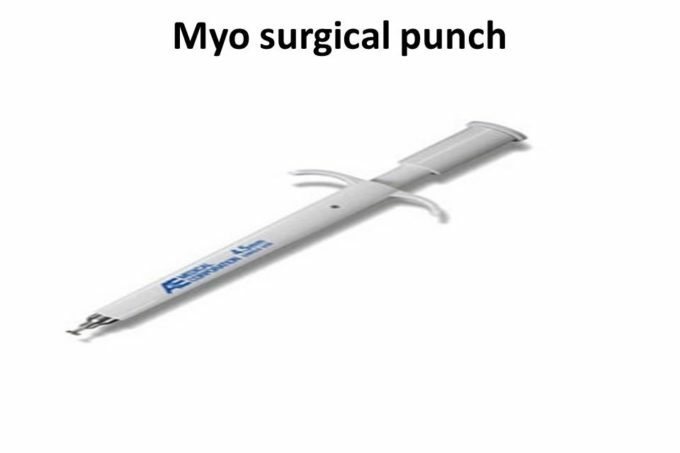 The Myo-surgical punch is single-use, sterile pack. Push and advance the ring using thumb and make a cut, slowly remove the punch. The required hole or ostomy can achieve according to the proper handling of instruments as recommended. Note: The Instruments must discard as per hospital recommended waste management criteria. Single-use and discard it after use.